David Buchanan recommends a career as an STEM teacher. A teacher recruitment campaign has been expanded to target university undergraduates studying English and Home Economics (HE) subjects, including food, nutrition and health courses. It will also seek to prompt people working in industries related to HE, such as catering or textiles, to consider retraining. The ‘Teaching Makes People’ campaign was first launched in February and will continue its initial focus on those studying and working in science, technology, engineering and maths (STEM) careers. Launching the new phase of the campaign, Deputy First Minister John Swinney said: “This government’s investment has resulted in 253 more teachers last year. However, I recognise that some local authorities are facing challenges recruiting the right number of teachers for their classrooms. “That is why we are expanding our successful ‘Teaching Makes People’ campaign which highlights the opportunity for a hugely rewarding and inspiring career with the chance to make a real difference in the lives of children and young people. Engineering graduate David Buchanan started his career working in the private banking sector before becoming a maths teacher at Airdrie Academy. 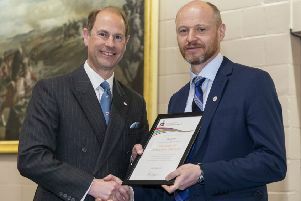 He said: “To anyone thinking about a career as a STEM teacher I would highly recommend it. There are few careers where you are fortunate enough to be a part of something that is always evolving and regularly appearing in the news with new discoveries or breakthroughs.